iPod on the plane! iPod for La Nena, actually — an expert flier who travels well but can color only for so long. Before every trip we’ve taken for the last three years, I load the iPod with a few new kid-friendly songs (God Bless You, Dan Zanes and They Might be Giants) and at least a couple kiddie TV shows. It’s happy-making for all involved, let me tell you. Unless, of course, the iPod battery fritzes out on you, like mine did on our trip a couple of weeks ago. Argh, carajo. It lasted for just a few minutes, cutting off Ruff Ruffman in a very rude sort of way. We had just taken off on the second leg of our flight North. Maria had colored enough on the first leg y yo de boba had put On the Banks of Plum Creek in the suitcase. I pulled out my netbook and showed her how to “paint” while she listened to Exposé. Hey, ’80s pop is awesome whether you’re 6 or 42. Amen. She got frustrated by my touchpad mouse. Here’s what I should have downloaded to the netbook as a back-up: The adventures of Pancho and Pita, playful bilingual trolls who just debuted in the cyberworlds. That Raul, he knows I am a sucker for anything with Pollitos. So, a while back, he sent me a free copy of the adventure to let Maria test drive it. She got to decide where to look for the pollitos, thus making her part of the story. I kept marveling at the quality and being damned glad for a safe online game, and a bilingual English and Spanish one at that. Ay, how I wished on that plane to have downloaded the story to the netbook. From the press release: “We envisioned an innovative approach that would combine the best features from the existing products: the emotional and educational power of books, the fun of cartoons, and the interactivity of computer games,” Raul Fernandez said. 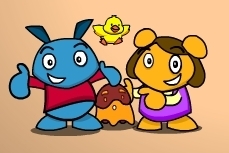 The Fernandez’s worked with language professionals, animators, voice actors and a music composer to create Pancho and Pita’s adventure and make their company, Palabra Media, a reality that meets the demands of a changing national demographic and interests. Raul and Stephanie put their heart into a great quality product that promotes culture y cultura, education and fun. Go download. Support this entrepreneurial y nice Latino. You also can download this pancho and pita coloring PDF, among others and watch video. And, if you ever hear a woman saying “Play with your Flan” on a plane, that is me. Thanks for the writeup, Carrie! So glad you guys liked it. My kids have the same issue when we’re traveling. Looking forward to those books. Keep us posted please. As a former educator and strong believer in preschool and bilingual exposure, it is refreshing to see new products coming out. Where we you guys 5 years ago when my little ones were babies? Just kidding. ¡Suerte! I can already imagine my Gabe going nuts over Pancho and Pita. Very well done. Thank you for sharing. I myself have my iPhone loaded up with all kinds of songs, videos, and games, but this looks great. Ojalá they come up with an iPhone app for this soon. So we can also play with our flan. Gracias a todos for the kind comments! @Ana, @Rubén, the “aventura” can be purchased directly from our website (http://panchoandpita.com/downloadadventure_en.php). You can download directly to your (Windows) PC in just a few minutes. This sounds adorable! I wish my kids were younger… We have come a long way from Dora the Explorer. I’m so glad other bilingual children will have some other options. Glad you guys are interested in Raul’s bilingual adventure…and Sra. Lopez, un placer. I love reading your blog. good planning always help the trip go better. I just can’t help but think of our kids traveling without MP3, video, Ipod, DVD players. Maybe we carried more books. We even were lucky enough to take some overseas trips.